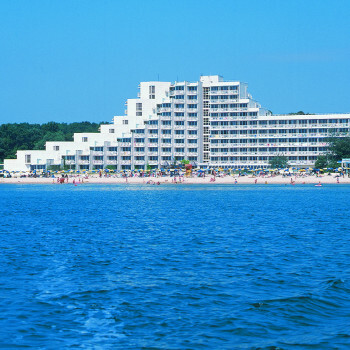 This hotel has a great location, 1.5km from the resort centre of Albena, on the marvellous sandy coast of the Black Sea, and close to a protected natral forest. The Gergana Beach is the ideal holiday retreat for families and enjoys a lively atmosphere. The rooms were super small and outdated. All 7 of us got sick with a stomach virus. The stuff told us that it has been like this the whole summer. Many of the guests and staff were getting sick. The parking was a HUGE problem. Opposite the hotel there is a reservation with a small river that stank real badly. I wouldn't recommend this hotel to anybody. Travel operator: Sunny Tours Ltd. Booked flight and hotel seperately through Balkan. Spent the first week in another town and the second week here. Flew from Manchester, good flights no problems. The hotel Gergana is this year made up of three hotels, Gergana 2 the last on the beach and Gergana 1 the next two hotels going towards the centre. Balkan guests were accomodated in the middle hotel part of Gergana 1, i think this was formerly hotel Mura. Guests could use the facilities of all hotels except the restaurant in Gergana 2 which was payable to guests of Gergana 1 hotels. We were pleasantly surprised on arrival to be told that the hotel was now all inclusive plus and all inclusive was now until 11.00pm as oposed to the advertise 10.00pm and that guests had free use of 2 loungers and parasol per room on the beach in front of the hotel. Booked a sea view double and we were allocated a 4th floor room with views over the main pool and right down the beach. The room was lovely and appeared to have been recently refurbished. Air conditioned, plenty of storage space had bath and over bath shower. The standard of cleanliness was good throughout the hotel. In the restaurant plates, leftovers cleared qiuckly and tables cleaned as soon as finished with. Maids visited daily and towels were changed as required, just leave them on the floor when ready for replacing. Maids also made swans, fans etc out of bedspeads. The food was the only thing that let the hotel down. Having visited Bulgaria before we were aware that food in hotels except for breakfast is usually poor, so thankfully we did not go with high expectations. Breakfast was fine there was plently to choose from, pastries, pancakes, eggs, cheese, salads etc. Lunch and dinner were usually the same things and for the first few days there was plenty of choice. The choice of food deteriorated as the week went on and did become very monotonous. We would have definately have needed to eat out if staying for 2 weeks. Having said that you could always find something to eat and neither of us experienced any stomach upsets. I not sure if the lack of choice was due to the hotel closing shortly. Guests of Gergana 1 could only eat in this restaurant. We walked through Gergana 2 restaurant one evening and the food and choice looked much better. You could pay to eat in this restaurant. There were 2 snackbars but can't comment as we didn't use these. There was a good choice of soft and alcoholic drinks. The hotel location was excellent right on the lovely beach. It was a 10/15 minute walk to the centre or you could catch the little noddy trains that run around the resort. Quite expensive by Bulgarian prices at 2.50 lev per journey. We were very lucky with the weather and i spent most of the days on the beach or around the main pool. If you like swimming as i do the hotel is excellent as you can alternate between sea and pool without moving all your gear. We found most of the staff to be very friendly and helpful and very hard working. Made to feel very welcome on arrival and this contiued throughout the holiday. A couple of the bar staff around the pool bar seemed quite indifferent but other than this all were very nice. The hotel had a young entertainment team who worked hard throughout the week and invited everyone to get involved but did not pester you to do so if you didn't wish to. Enertainment was made up of darts, boules, volleyball, arobics, bingo etc and a show in the evenings. We did'nt watch any of the shows so can't comment. Not having stayed anywhere with entertainment i don't have anything to compare it with but we felt it was good lighthearted fun. The hotel had a large outdoor pool by the beach with pool bar which was lovely and two small outdoor pools plus small indoor pool. We met some lovely people and just tended to sit in one of the bars chatting in the evening. Despite the food i would definately visit this hotel and resort again. If you just want a beach holiday and get the weather the setting and is excellent. You just need to be aware the food is not that great. My Daughter and I stayed here with her daughter who is 10 months old. We arrived at 2am local time, Varna airport were quite slow and un-organised. The hotel were organised and check-in for a whole coach load was speedy despite it being 3am by the time we got there. First impression was that the room despite being a "family room" was it's SMALL, when asking we found we had one of the larger rooms too. The rooms all had a safe which was apparently easy to break into we found out as some friends we met had their safe ripped off the wall and their money, credit cards, cameras and phones stolen, The hotel management appears quite dis-interested by the occurrence, as were the Police. The maids were active daily but did not clean thoroughly throughout our 2 week stay. The food was well cooked, served hot, but the menu was very German based , they seemed to only offer three types of meat each day plus fish there was a carvery each day as well, but the menu was very similar all the time. Apparently it is in the process of being bought out by a German company, and First Choice do not have an allocation to here in 2007. The restaurant had the usual problem with birds flying through it. Hotel staff were variable some were very friendly and some quite miserable. The fact we had a 10 month old baby helped break the ice with a lot of the staff. Although the entertainment staff were quite different being friendly and helpful despite their extremely long hours and working 6 days a week. Just returned from Gergana Hotel, Albena and I have to say I have very mixed feelings about the place. Firstly the beach was beautiful and if you want a beach holiday this is definitely the place, providing you have the weather! The hotel was very very clean and the cleaning staff were wonderful. Other staff throughout the hotel were rude and sometimes extremely ignorant, not at all helpful! One thing to be aware of is, do not use the mini bar in your room or the telephone, the prices are ridiculous!!! Now food is a very tricky subject as everyone has their own taste but my personal opinion is don't eat at the hotel, the food is bland and very German based with everything being under cooked, my husband didn't mind this, he liked all the food. The poolside bar and food area is good for lunch and reasonably priced. The TV in your room is very boring as well, all the channels are German or Bulgarian, so where it says '' satellite TV in all rooms'', be aware that if your English you won't find anything to watch if you have to stay in due to weather conditions. You should also know that this hotel is very German orientated, so everything revolves around what the Germans would expect. Although I enjoyed most of my time here I definitely would not go back!!! Just arrived back (this morning)from 7 bril days at this hotel and already planning to go back next year. The hotel has the best location in Albena,what could be better than waking up every morning to golden sands & blue skies. Food was spot on with lots of choice, fish, meat, veggie + a Bulgarian dish every night. We eat in the resturant every night and never had the same thing twice. We chose the later sitting which was mainly for adults with the odd toddler,this suited us down to the ground. I must personally thank Yasmine the first choice rep who work so hard to make sure we had a good time and also gave us a lot of information about Bulgaria & the region of Albana. We took two trips Jeep safari (be prepared to get wet, but have a bril day out in the local forests) & Varna wine tasting (this was a tutored tasting in a wine cellar in Old Varna) well worth an afernoon out. Animation team work tirelessly 12 hours a day and by the end of the week we surprised ourselves by joining in & enjoying most of the activities. Plenty of sun beds even at 9.30/10am, so no need to get up at the crack of dawn to put your towels out. pool is spotless and safe, two life guards most of the time. The pool does close about 6pm for cleaning, but theirs always the sea. While we were there the sea was a warm 27c. I would recommend this hotel to anybody and would challange you to find a better hotel in the whole of Albena. If you are looking to book a holiday at this hotel you have made an excellent choice it is perhaps the best in the resort. I have not heard or read a bad word about it and that is not surprising it's very good. You will have a fantastic time! Rooms are definitely 3 star but cleaned every day. The restaurant has plenty of choice ranging from full roast to salads - I never had the same meal twice. There is even a kids section! Breakfast is equally as varied with full English or Scottish as my wife refers to it or you can have cereals, fruit and yoghurt or salad cheese and a fantastic range of local cold meats plus pancakes for the kids. The staff are well trained and they genuinely look happy to help you. The First Choice Rep Yasmine (Bulgarian) was a real star. We went on the full day Yacht trip (95Lv for adults 40Lv for Kids) which I will recommend to others but please take mozzy spray. ~ The hotel is next to a reserve with a small lake. We did not have any trouble with insects but I am not sure about other times of the year. The Gergana is a good hotel compared with other Bulgarian hotels. My eldest daughter travelled with me and this was her first visit to Bulgaria so she was not overally impressed, but then she does use top class hotels in Europe for her work but she felt that it was very clean throughout. We were given a family room (no idea why) so the bathroom was a good size and having seen a standard 2 bedroom we were pleased with this, however, we would have managed if we had been allocated a standard room. The breakfasts were lovely, plenty of choice and food was hot. We did not eat in the hotel as we visited friends some of the time and tried various restaurants but we did sample the food at the poolside and this was fine and not expensive for a hotel. The pool was not crowded on the first 2 days but did become so afterwards so we needed to get up early and put towels on sunbeds. The shop at the hotel is fine and the staff helpful. The only gripe I had was with the entertainment team, we prefer to entertain ourselves and we were constantly asked to join in various activities, I appreciate that they are still learning about this and some people want entertainment but I did not like being pestered. However I can see that the kids club would have been great if required. Take a mozzie plug in and any other repellents you use because of the closeness to the nature reserve, I got bitten only once and our room was at the side of the hotel overlooking the nature reserve, which was great, nice and quiet. Had a fantastic, relaxing two weeks at this hotel. The location is great, directly on the beach and not too far from the main town. We took a leisurely stroll to town most evenings although there is also a local "Noddy Train" which runs back and forth regularly. The hotel was spotless, although we were disappointed with the size of our room...twin beds and bunk beds left us with virtually no floor space. I would book interconnecting rooms next time. The hotel staff were friendly and very helpful. Our rep Jasmine was great and the small problem that did arise she sorted immediately. We went on a few excursions...I would not recommend the Dolphinarium and Varna trip. Beware of the gypsy ladies in Varna who constantly approached us. Entertainment staff were very busy, there are numerous activities which you can join in ....we chose to relax by the pool (our children loved it, great size and very clean also it felt very safe as it was not overcrowded and there was usually a life guard on duty too). I would most definitely recommend this hotel to families and couples. The hotel was much better than we expected from its star rating. The Hotel staff and the First Choice rep were very helpful & efficient and the room was spotless. The location is excellent, right on the beach, though a longish walk from the resort centre. Albena is excellent, smaller and quieter that Golden Sands, but with a good choice of restaurants. Visiting Varna and Balchik (for the Quiet Nest gardens) is a must. Excellent hotel, very clean, great location, breakfast lots of choice & always of good standard. Staff very helpful, entertainers round the pool worked very hard keeping children & adults amused all day. Places to eat are Poco Loco in main town with dancing waiters, The Old Oak which is about 5mins walk down the main road from hotel excellent food & entertainment. Went to Golden Sands for the day but didnt like this resort to much like Blackpool. Weather nice & sunny. All in all had a great time & can't wait to go back next year.